The intersection of Terminal and Quebec is a crossroads of culture and community. It’s a crossing for children, commuters, tourists, office workers. It’s a meeting place for anyone en route to transit, the seawall, shopping and playgrounds. From June 6, they’ll also see a marker at that junction—one that Musqueam artist and educator Shane Pointe calls “a spirit map” of sorts. Crafted in tile and reminiscent of Indigenous symbols of the natural world, Vancity’s Reconciliation Mosaic stands as a tender reminder of tragedy and sadness, expressed through a lens of beauty and hope. It would be natural for passersby to hone in on the outer circle of medicinal plants, surrounding four hands in a circle of gratitude. But what stands out here is its centerpiece: a striking North Star, its highest point aligned with true north. The GreenLight artist collective, including Pointe, Sarita Baker and Rob Martin, suggest with the North Star a sense of direction and momentum. The star is a guide for positive action among Indigenous and non-Indigenous people as they move through the process of Reconciliation. Last year, Vancity asked artists city-wide to submit a design that would capture the essence of Reconciliation. The proposal from GreenLight stood out among 18 submissions for its simplicity. 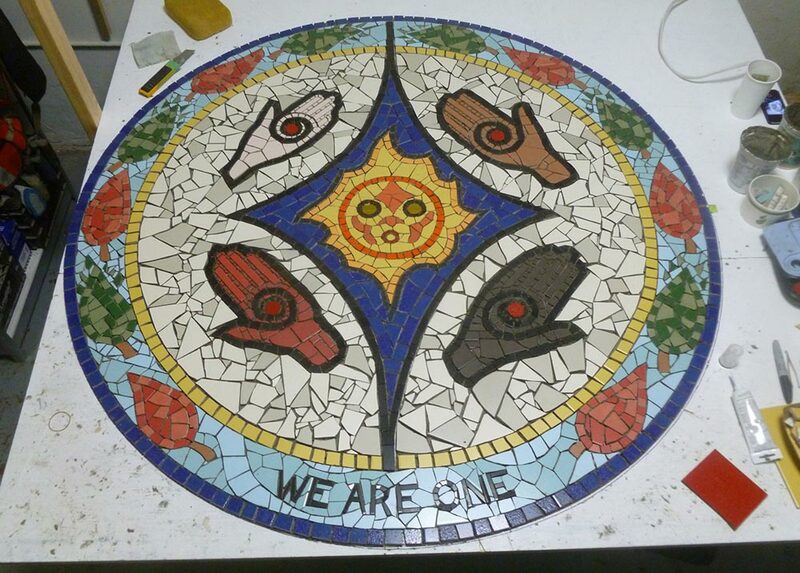 As part of Vancity’s commitment to embedding the principles of Reconciliation into its work and partnerships, the mosaic will live at that crossroads. It stands as a beacon to anyone willing to quiet the mind, look and listen. The challenge with art about Reconciliation is how to address a significant historical and political issue within a single work. When GreenLight took on the mosaic project, they wanted to make it inclusive and simple. They used solemn, elegant symbols to help passersby ease into a public conversation. “I see Reconciliation as a grassroots thing, and it can start from art. Art has a way of reaching people,” says Baker. Mosaics have told stories of public life since the 3rd millennium BC, across cultures from Ancient Greece and Rome. Over the last 200 years, the form has been ‘democratized’ for the street. Ceramic, tile and stone are proven hardy materials for street art. That resilience gives the mosaic its power as a lasting conversation piece, says Martin. Mosaicist Bruce Walthier fashioned GreenLight’s design with ceramic tile and glass. The mosaic brings to life the light blue river surrounding the central North Star and golden sun. They share space with symbols of healing: stinging nettle and devil’s claw leaves, and red ochre on each coloured palm. “We need those Coast Salish symbols to come forward, because they were pushed down historically. That process of moving toward Reconciliation requires a change in the power structure,” says Martin. The words “We Are One,” taken from a Coast Salish phrase, curves under the star’s south point. Though it’s a message of unity, Shane Pointe brings the ‘We Are One’ sentiment back to the artistic process. The best public art has the power to jolt the viewer into a new mindset, says Baker. Mary Frances is a writer and champion napper. She spends much of her life hanging with her teenage son, indulging weekly in the city’s arts scene, and working as a communications specialist at Vancity.